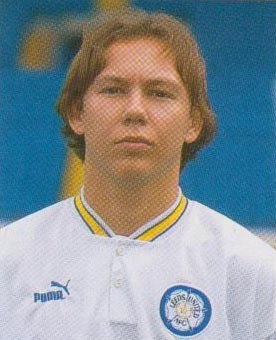 Shepherd joined Leeds as a trainee professional and signed professional forms on 15th September 1995. He featured regularly in the Youth team with the occasional Reserve game and November 1995 he was called into the England Under-Eighteen team. He made his debut for them on 16th November 1995 in a Group Thirteen UEFA European qualifier at Nene Park, Irthlingborough, in a 2-0 win over Latvia, being replaced in the seventy-second minute by Len Piper. He got his second cap two days later in a 6-2 win over Sweden at Rockingham Road, Kettering, and he got England's second goal to level the scores at 2-2 in the fifty-third minute before being substituted by Andy Ducros in the seventy-eighth minute. He picked up his third cap in a 1-1 draw with France in a friendly at Stade Alberto-Corazza in Meaux on 28th February 1996 when he was substituted by Jamie Cassidy. This was soon followed by two more caps in the Second Round Group Six UEFA competition as England twice beat Scotland 3-0 the first on 19th March 1996 at Fir Park, Motherwell, and the second on 23rd April 1996 at Huish Park, Yeovil, where he again found the net in the seventy-sixth minute for England's second goal. His final four caps which brought his tally to nine, came in the Finals of the UEFA competition in France. He played all three of the Group B games as England drew 0-0 with Spain at Amneville on 23rd July 1996 and two days later drew with Italy at Rombas, before defeating the Republic of Ireland at Amneville on 27th July 1996 to qualify for the third place play-off. This took place at Stade Leo Lagrange, Besancon, four days later and England beat Belgium 3-2, after extra-time, and Shepherd was replaced by Jamie Cassidy in the ninety-first minute. It was a surprise when George Graham called him up for the first team on 26th October 1996 at Arsenal for his first and only game for United at senior level. He became a regular in central defence for the Reserve team and he gained England Youth honours and was part of the 1997 England World Youth Under-Twenty Championship squad in Group F in Malaysia, along with his Leeds teammate Mark Jackson. He started in the the three Group games which were all won and all played at the Larkin Stadium, Johor Bahru. He scored the winner after sixty-nine minutes, as England beat Ivory Coast on 18th June 1997 and two days later there was another full game as England defeated the United Arab Emirates 5-0 and three days later he got his third and final cap as England beat Mexico 1-0, and he was replaced with three minutes left on the clock by Jason Crowe. He missed England's final game of the tournament when they were beaten 1-2 by Argentina, remaining an unused substitute on the bench as his teammate Mark Jackson played a full game. However, the competition for places at Elland Road was intense and he was loaned to Ayr United for a month in March 1998, where he scored once in six League appearances. In February 1999 he was loaned to Tranmere Rovers for a month but only made one substitute appearance. On 8th September 1999, there was talk that he could be joining Colchester United, after they had watched him in action in a 2-1 reserve team win over Manchester United. He left Leeds on 1st October 1999 and joined Ayr United where he had been previously on loan. He scored once in twenty-one League appearances, of which one was from the bench, as well as making five starts and one substitute appearances in the Cup competitions before having a three month summer spell in Iceland with Keflavik IF in the English close season of 2000. He joined Scunthorpe United on 29th September 2000 on a free transfer. He only managed one substitute appearance with the Irons before joining Luton Town on 22nd March 2001, again on a free-transfer after also having trials with Crewe Alexandra and Wimbledon. There were just seven League appearances for Shepherd at Kenilworth Road before he was on the move again, joining Oldham Athletic on a free on 1st October 2001. He did not make the first team at the Latics and was loaned out to Scarborough on 14th December 2001, scoring twice in ten League appearances before returning to Oldham on 12th March 2002. He dropped into Non-league football when Conference club Scarborough came back for him for the new season, getting him on a free-transfer on 1st July 2002. He was a regular with Boro scoring six times in thirty-five League games, one of which was as a substitute. He also played three other games in the Cups before he left. He had a trial with Yeovil Town, but, after a first half trial for the Yeovil Reserves at Dorchester Town on 24th July 2003, he was not taken on. He did, however, join a further Conference club, Leigh RMI, once more on a free, on 7th August 2003. Again he was a regular making twenty-five starts and four games from the bench and scoring once in the League and played one Cup game before being released on 4th May 2004. He then joined Harrogate Town on a part time basis in August 2004 before moving to Stalybridge Celtic on 3rd February 2005. He made his debut two days later at Ashton United in the Vanarama Conference North in a 3-2 win. He scored his first goal in his twelfth game in a 1-2 home defeat by Kettering Town on 12th April 2005 and added a second in a 2-0 home win over Hucknall Town thirteen days later before playing his sixteenth and final game on 30th April 2005 in a 3-2 away win at Redditch United. He retired in May 2005.